Foliage: stipe is smooth, slender and pale green or tan; grows in a symmetrical clump. Two types of fronds: fertile and sterile. 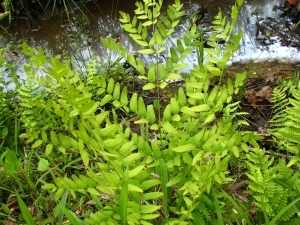 Fronds are doubly compound with wide spaces between leaflets and subleaflets. Spores: spores are found on the dark green fertile leaflets at the end of the fronds rather than on the underside of the leaves as most ferns do. 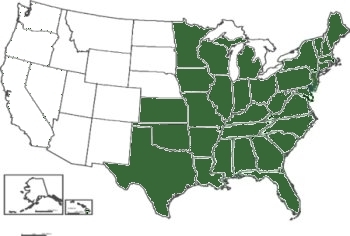 Range in New Jersey: statewide, especially common in northern uplands. Misc. O. regalis is wind dispersed or can be propogated by dividing rhizomes. The fibrous roots are used in the potting of various orchids. 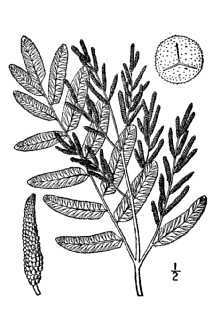 Osmunda, the Saxon god Osmunder the Waterman. Legend says that he hid his family from danger in a clump of Osmunda.